While coming from Jaipur towards Agra this majestic fort is visible at your right side from a distance. This fort is located at a distance of 37 KM from Agra near a small town Sikri was founded in 1569 AD by Mughal emperor Akbar. Tourist enter to this fort through Agra gate. 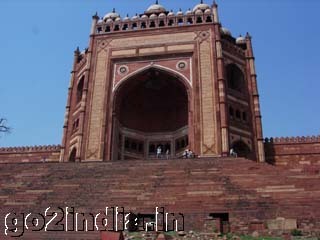 This big gate was constructed by Akbar in 1602 AD to commemorate his victory over South India. This gate has a many number of steps in front of it. There are many horseshoes nailed to the main door. Horse owner paste the horseshoe here to pray for speedy recovery of their horses. 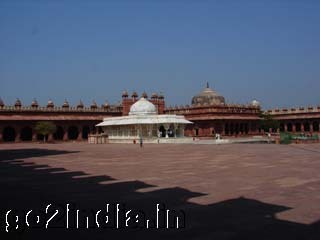 The tomb of Sheikh Saleem Chishti's inside Fathepur Sikri is located at the center of this fort. This was constructed by Akbar in white marble. This white building is of 48 Square feet area houses the cenotaph of the saint. This is surrounded by by a beautiful marble screen in floral design. It is famous place of pilgrimage for all he communities of India and people believe that all the desires of an individual are fulfilled as one commits to tie a thread here. There is a system to collect rain water from top of the tomb through pipes running through the pillars of the tomb. This fort once the capital of Akbar was deserted within 50 years of its construction due to water shortage. Guides are available and fee you can bargain.